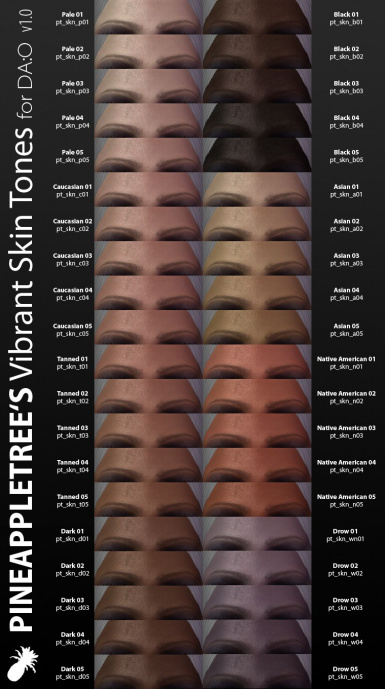 This adds 48 new hair & eyebrow colors, 40 new skin tones and 30 new eye colors to the Character Creator and replaces the 11 eye colors originally shipped with DA:O. If you don't want to use the replacement eye colors, you can download a special package without them! 1. Open the *.mor file of your character with the Toolset. 2. Go to MORPH_TINTFILENAMES and change the content of line 11 to the color you want to use. E.g. if you're using the tint "pt_har_bl4" for your hair, you have to change said value to "pt_stb_bl4". 12.12.09 - Version 1.31 - Aloha! I was finally able to solve the problem of bright lines appearing in a number of hairstyles, when using my additional hair colors. 12.12.09 - Version 1.3 - Aloha! This version adds a bunch of new eye colors to the package, for a new total number of 30 (41 if you include the replacements). I changed my "No Neon Blue or Evil Red" policy a bit, so now you can find some more "exotic" and glowing colors! 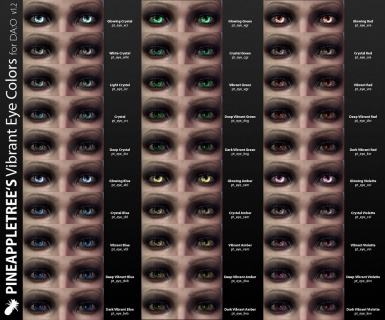 Also you get 48 new eyebrow / stubble colors, maching the hair colors allready in my addon. And finally I altered the replacement colors once again to get even a bit more live in them. 25.11.09 - Version 1.2 - Here it is, the big update adding no less than 48 completely new hair colors to this package and therefore to your DA:O CC. Was a bit of work, but I think it was worth it. 24.11.09 - Version 1.01 - Fixed the problem of the black hair tint disappearing from the CC. Generally, I tried to maintain a somewhat believable and not too artificial look with all of these colors. As with my other color mods, I built this library of hair colors "from scratch". 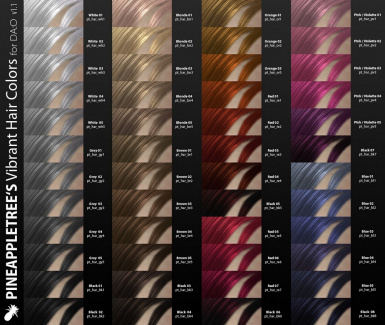 They range from bright white to black, to blonde and brown, to red and some more exotic violettes and blues. The new hair and eyebrow colors share the same order in the ingame CC (which you also can find in the hair preview picture in this package). So if you use the same slider settings for both, you will allways get matching colors.
! !You can still use the hair colors originaly shipped with DA:O! They simply moved to the end of the list in the ingame CC.!! These are all new made tones, ranging from pale to deep black. and (especially for our elfs out there) 5 "Drow" tones (dark, unsaturated blues). Their ingame order is the same as in the respective preview picture you got with this package.
! !You can still use the skin tones originaly shipped with DA:O! They simply moved to the end of the list in the ingame CC.!! These new colors are all very light and vibrant, especially when compared to the vanilla color palette. (from lights to darks) Greys, Blues, Greens, Ambers, Browns, Black, Reds, Violettes. It's a subtle effect, that makes the eyes appear much more vivid, and respondent to surrounding lights in the game.
! !This will affect not only the eye colors you can choose in the ingame Character Creator but also those of most of the NPCs around the DA:O world!! Should you have an old version of this addon, please delete it first! 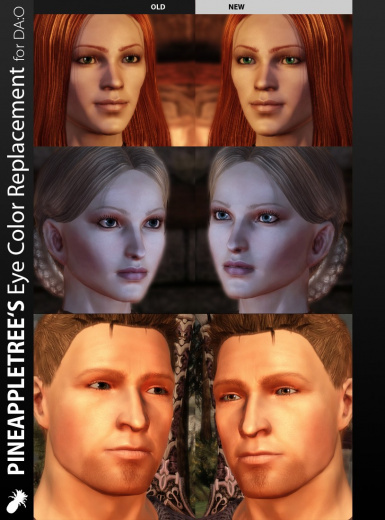 Unzip and copy the folder "Pineappletree's Vibrant Colors 1_3" into your [...]\Dragon Age\packages\core\override\ folder. 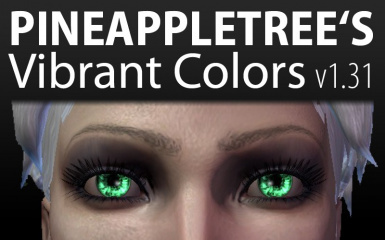 Just delete the folder "Pineappletree's Vibrant Colors 1_3" from your [...]\Dragon Age\packages\core\override\ folder. This will most probably collide with any other mod that integrates new colors, hairstyles, beards, etc. into the Character Creator. This is because they come with their own version of the file "chargenmorphcfg.xml" - telling the game to integrate their own files into the CC, but - of course - not mine. For any other mods, you will probably have to edit said "chargenmorphcfg.xml" yourself. This problem should only affect the integration into the CC! If you're allready playing chars created with any other mod of this kind, they should stay exactly the way they are! Since I long stopped working on DA, you may do with this mod what you want and without my explicit permission, as long as you keep it free of charge and off Steam and its ilk. Keep me in the credits, if you are a nice person.